Messina Hof Winery joins TRACE to celebrate Texas Independence Day with an evening of wine and bites, all capturing the spirit of the Lone Star state. Taking place on the TRACE patio in downtown Austin, join Messina Hof’s CEO and head winemaker, Paul M. Bonarrigo and taste some of the winery’s most exclusive and newly released wines. 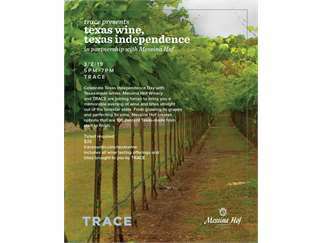 The exclusive Texas-made wines will be paired with bites from TRACE. Guests can truly enjoy an evening of celebrating all things Texas. Tickets are $35 per person and can be purchased here, http://www.traceaustin.com/texaswine.